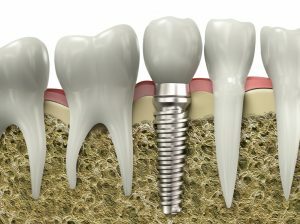 Dental implants can be used to treat all cases of tooth loss. While the procedure will vary slightly depending on how many teeth you are missing, the overall process is the same. To determine if dental implants are right for you, you will first need to undergo an initial consultation. During the consultation, your oral health will be evaluated. You must have healthy gums and enough bone density to support the implant. However, even those with decreased bone density can still benefit from implants with added procedures, such as bone grafting. In addition, you must be free of medical conditions or lifestyle habits that increase the risk for implant failure. If it is determined that dental implants are right for you, a customized treatment plan is created. During the first phase of the procedure, biocompatible titanium posts are surgically inserted into the jawbone while you are under local anesthesia. The jawbone will naturally accept the implant, fusing to the implant post. Over the next several months, your jaw will securely bond to the post. During this time, you must keep the area clean and protect the incision site from irritation and damage. After your jawbone has fused to the implant, an abutment is attached to the implant post. This allows the gum tissue to heal around the implant for a natural appearance. Finally, a costume-made prosthetic crown is attached to the abutment to complete your smile. Once your smile has been restored, you will regain proper oral functions and confidence with a permanent solution. Your implants are specially designed to last a lifetime, however, there may come a point when the prosthetic crown may need replaced due to wear and tear or damage. As an implant dentist in Los Fresnos, we offer the implant restorations needed to replace a damaged crown. 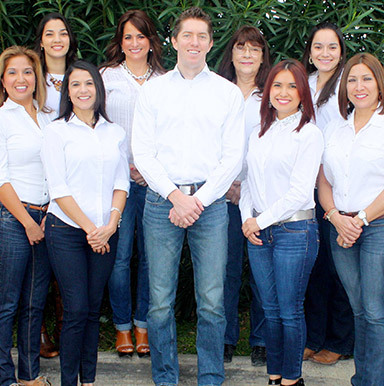 At Los Fresnos Dental Center, our team of dentists are committed to delivering dental excellence. If you are missing teeth, we perform the necessary consultation to see if dental implants are right for you. We create the treatment plan needed that is specifically tailored to your tooth loss to permanently replace missing teeth. If you are ready to regain your quality of life, confidence, and oral health, it is time to see if dental implants are right for you. Contact our office today to schedule a consultation.